Why the 2011 Toyota Venza? Distinctive and contemporary - best looking of the 'crossover' type vehicles although I consider this a wagon and not a crossover. Looks more like a car than a jacked up and boxy SUV. Love the multi-functional center console - lots of storage. Also like the Panoramic roof, smart key system and power open/close rear liftgate. The 13 speaker JBL is very nice but could use a subwoofer. The V6 (FWD) is extremely quick and very smooth and quiet even under spirited acceleration. The transmission is very smooth as well and the shifts are barely detectable. This is my 4th Toyota (2nd was a 2002 Lexus ES300) and am generally pleased with the car but the overall quality is below that of previous Toyotas. My MPG is averaging between 24-25 MPG which is quite acceptable. Most of my driving is on highways with maybe 10% city (stop & go) which would probably lower my average. Best MPG on highway was 27.8 mpg as calculated by the onboard MPG display. 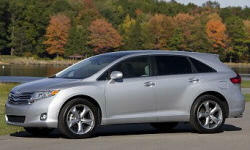 Why Not the 2011 Toyota Venza? On less than perfect roads the road noise is a bit annoying. This may be due to the Goodyear Eagle RS-A tires. If the road surface is smooth asphalt, then the road noise is minimal. Maybe switching to Michelin Lattitude HP tires would help. If the road surface is a bit rough then the ride gets rough too. The low profile tires and 20" wheels obviously affect the ride quality when the road is less than glass smooth.